Did you know that the oxygen in the atmosphere originally came from photosynthesis in the ocean? Or that the earliest evidence of life is found in the ocean? The ocean provided and continues to provide water, oxygen, and nutrients. It moderates the climate needed for life on Earth. 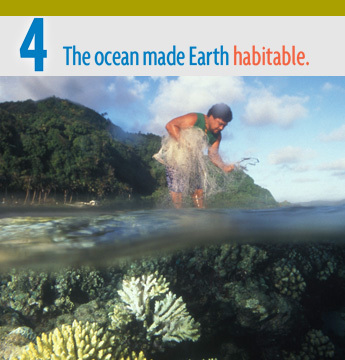 4: The ocean made Earth habitable. c. The ocean provided and continues to provide water, oxygen, and nutrients, and moderates the climate needed for life to exist on Earth ( Essential Principles 1,3, and 5). This material is based in part on work supported by the National Science Foundation under Grant No. 0215456. Any opinions, findings and conclusions or recommendations expressed in this material are those of the author(s) and do not necessarily reflect the views of the National Science Foundation. Copyright © 2016 NEOSEC. All rights reserved.